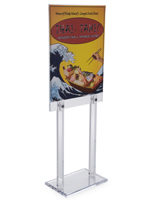 This standing poster frame that holds graphics stands 67" tall and holds (2) 22"w x 28"h images back-to-back for double sided viewing. 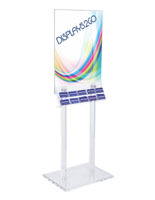 It is one of our most popular floor sign stands. This poster frame is field tested and a proven winner! Easy assembly, all hardware provided for this postings display. Each poster frame ships in two boxes. Upscale, thick, polished clear acrylic draws attention to your bills, notices, pictures, prints and brochures! 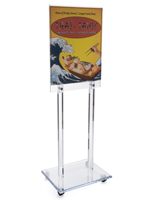 The floor standing unit, poster frame has base dimensions are 24" wide by 18" deep. 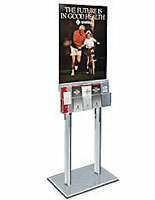 This lobby sign available with brochure/magazine pocket attachments and/or custom headers, see related products below. This poster frame, also known as an acrylic display, is also available in a series of wall mounting and ceiling hung models. If a custom poster display is more applicable for your needs, contact one of our custom sales representatives to discuss your ideas and pricing. See our "Related Product" section, to the right, where we offer a wide variety of pre-printed posters for retail, financial and marketing based businesses.